Here comes the precipitation...it has been struggling to make much advance today thanks to all the dry air sitting over the mid-Atlantic. You can see how much colder temperatures are where precipitation is falling. This is thanks to the "wet-bulb effect"---when air cools as precipitation falls into dry air and evaporates. This will play a major role in getting our temperatures down low enough to support snow overnight. You can see it's already starting to occur across the southern Valley where temperatures are now down into the low to mid 40s. I'm not going to make any major changes to the snow map tonight. 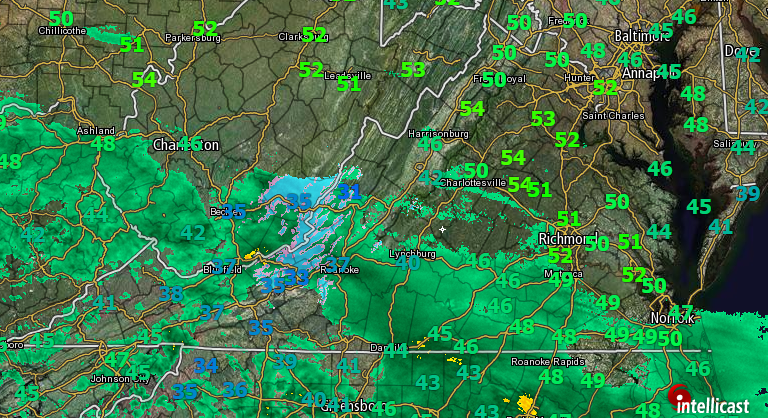 While most of the Shenandoah Valley will see snow fall, not everyone is going to see snow stick. Chances increase with both latitude and elevation. There may be a couple inches across the northern Valley and higher elevations of the western Highlands and Blue Ridge Mountains. Elsewhere, expect anywhere from simply a wet ground to a coating. I should note many of the global models offer a colder, snowier solution. You may see other forecasts more aggressive than mine. I chose to stick to a combination of higher resolution short range models and climatology (and a warm ground and marginal surface temperatures) while making this call. I wouldn't be surprised to see an overachiever or two at higher elevations. Timing: Showers developing by late evening...8-10 pm. Rain will start to mix with/change to snow after midnight before ending as rain Friday morning.